Thank you for your feedback. I know that the bug is annoying. As well as the user interface interaction is not very clear. But please consider that it was made within 72 hours and a lot of time went into graphics and balancing tests. The highest level a player has reached yet was 23, as far as I know. The trick is to reassign the crew regularly. Also they will stop work when they´ve got hitten (which was more or less intended). If you want a more polished version, follow me and stay up to date. The 50 coins item is a stats upgrade. 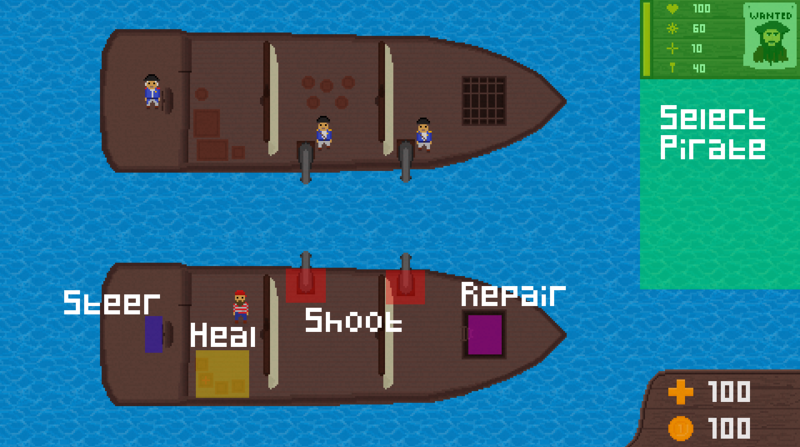 It will lead to more repairing power, more damage at the cannons and less damage taken while steering thru rough sea. I am sorry to disappoint you. But as you can see both jams had the same time line and it is not prohibited to participate in more than one jam. Your aggressive behavior against other indie game devs, and FOSS community, shows me that you are not into the scene and may never will. If you have concerns about the plausibility of my submission, deliver a proof. Also, when I have a look at your submission I could easily say that I have spend more time on my game than you. Well, this game is the real winner. Amazing work and for sure the best one in the top10. 570 IS VERY IMPRESSIVE! I would say: Mission Complete! Haha :D Who needs proper driving physics anyway? I´m a vending machine. 100% match!